Classical scholar Professor Angelos Chaniotis is among 11 researchers chosen to receive the 2015 Anneliese Maier Research Award, and will collaborate closely with colleagues at LMU in the coming 5 years. The Humboldt Foundation has announced the names of winners of the Anneliese Maier Research Award 2015, which is conferred on outstanding scholars from abroad in the fields of the humanities and the social sciences. Candidates for the Award are nominated by established scholars based at third-level institutions in Germany, and the prize money is designed to enable awardees to carry out a collaborative research project in the nominee’s department. Among the 11 recipients of the award this year is Professor Angelos Chaniotis of Princeton University, who will use the award, which is worth 250,000 euros, for a 5-year collaboration with colleagues at LMU. Chaniotis was nominated for the prize by Professor Jens-Uwe Krause, who holds a Chair in Ancient History with a focus on Social and Economic History at LMU. Angelos Chaniotis is internationally known for his role in pioneering new approaches to the study of Ancient History. A native of Greece, Chaniotis is a specialist in the Hellenistic era, using epigraphic evidence to trace the history of social and religious developments and cultural mentalities in the Greco-Roman world between the age of Alexander and the Late Roman Empire. In particular, he has devoted a great deal of attention to the role of public inscriptions in shaping how the Greeks of Late Antiquity perceived their own history. His work has also led to important advances in our understanding of the significance of the emotions in the religious cults of the Roman East, and he is the author of the first comprehensive social and cultural history of warfare in the Hellenistic world. 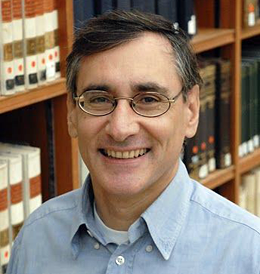 Chaniotis’ distinguished contributions to research have earned him a large number of honors, including the Order of the Phoenix, conferred by the Greek Government, and the Baden-Württemberg State Prize for Research. It is expected that his close collaboration with LMU in the coming years will stimulate the development of new perspectives on Ancient History in Germany as a whole, and he will also take an active part in postgraduate education. Chaniotis becomes the fourth Anneliese Maier Laureate at LMU. Linguist Professor Mary E. Beckmann, psychologist Professor Ulrike Hahn and archaeologist Professor Himanshu Prabha Ray have been among the awardees in previous years.